My father had a great deal of ambition with regard to my education. I was his favorite child. He took the most unwearied pains in teaching me, and I now ascribe whatever mental culture I may have, to the habits which he formed in me, at a very early age. I did almost worship my father[.] . . . To win a word of praise, to see him smile as he often would when I had recited a lesson remarkably well, was my highest ambition, when a child. I can distinctly remember when I was not more than five years old, seeing him look significantly at mother, when I had made some rather old remark. I knew that he was proud of me, and the thought was ever before me. It was unfavorable in its influence, in some respects: it inclined me to vanity, and yet it was a most powerful incentive to exertion. And perhaps after all that could hardly be called unfavorable in its influence, which led a child to bend every energy of mind and soul to the gratification of a parent. I inherited nothing from either of my parents except my mother's gift of cheer. Jackson in adult life, exact date unknown, quoted in Sarah Woolsey, "H.H." When Jackson was nineteen and twenty, and struggling to find her place in the world, she went through a phase of reassessing the effects of her upbringing. She was moved to examine her feelings by a new, close friendship with her guardian Julius Palmer. Her letters to Palmer from this period contain her only extended extant comments on her relationship with her father. In one of them, excerpted in an epigraph above, she emphasizes the huge intellectual influence he had on her in youth: he closely supervised her education, and she made it her "highest ambition" to please him with her attainments. In working to satisfy her father, she formed lasting "habits" of diligence in her studies, to which, as she entered adulthood, she ascribed all of the "mental culture" she had as yet obtained. Years later, however, she told her friend Sarah Woolsey that she had "inherited" nothing from her parents, except her "mother's gift of cheer"—her ability to demonstrate cheerfulness in the face of adversity. It is true that Jackson's parents did not leave her a financial inheritance: following her father's death, she was supported by her maternal grandfather, David Vinal, who left her and her sister Ann his entire estate upon his own death in 1854; it provided Jackson with a comfortable income for life.1 It is also true that Jackson's mother had a naturally ebullient temperament, which set a standard for Jackson. Yet Jackson's ability to persevere in the face of adversity actually represented an inheritance not only of her mother's "gift of cheer," important as that was, but also of her father's "habits" of diligence—a legacy that new intellectual influences had perhaps obscured by the time she spoke with Woolsey. In fact, Jackson inherited a number of personal characteristics for which she never explicitly gave her parents credit, but which would prove fundamental to her writing career—from the set of attitudes about health that led her continually to travel to her literary inclination itself and a belief that writing should be spiritually uplifting. Indeed, no other person or writer would ever have such influence over Jackson's writing as her parents had. That they died long before her career began did not lessen but quite possibly increased their influence: unable to confront her parents directly, she was turned back on herself, to work out her inheritance in writing. Jackson's father, Nathan Welby Fiske, was the son of a Weston, Massachusetts, farmer and veteran of the Revolutionary War, also named Nathan Fiske, who was neither learned nor very religious. But Nathan Welby's pious mother instructed her five children rigorously in the Westminster Catechism. Moreover, there had long been Calvinist ministers in the Fiske family—including yet another Nathan Fiske, of Brookfield, Massachusetts, who in the eighteenth century had been a prolific writer of moralistic newspaper essays.2 Nathan Welby's own dedication to the Calvinist faith began in 1814, when, during his sophomore year at Dartmouth College, a student revival led him to conversion. After graduating from college, he paused for only a few years—one in which he served as principal of an academy in Maine, and two in which he worked as a tutor at his alma mater—before he entered the Andover Theological Seminary, a training ground for conservative Congregational ministers. He graduated three years later, Phi Beta Kappa, and was ordained as an evangelist on September 25, 1823, at the age of twenty-five. The Reverend Elias Cornelius delivered the sermon that day in Salem's Tabernacle Church, on Exodus 14:15: "Speak to the children of Israel that they go forward." In the manner then customary, Cornelius cast America's Christians as the true children of Israel, permanently bound, as such, to "labour for the conversion of the world. "3 Jackson's father took his duties as an evangelist very seriously. After his ordination, he moved to Savannah, Georgia, to proselytize among seamen. But Fiske was by nature a scholarly, introverted man, and within less than a year he began considering various academic positions. In 1824 he accepted the offer of a professorship in Latin and Greek languages from fledgling Amherst College, a Congregational institution that, like most in western Massachusetts at the time, still adhered to the sort of orthodox Calvinism that Fiske had learned in seminary. Fiske would stay on in Amherst for more than twenty years. In 1828 he married Deborah Waterman Vinal; within the next four years Helen and Ann were born, and the family moved into a permanent home on South Pleasant Street. During these years, before paved roads, sewers, or electricity, Amherst was a quiet, rural town, notable for its lack of growth and industrial development, and also for the unchanging Puritanical thinking of its small population.4 Yet even in a town where strict Calvinism was the norm, and at a college founded to further that religion, Nathan Fiske stood out for the degree of diligence with which he carried out his professional duties, and for the fixity with which he proselytized submission to the Calvinist God from each of his positions as professor, minister, scholar, and father. Nathan coped with his difficulties by means of a disciplined perseverance that he would seek to instill in his daughter as well. Possessed of a firm belief that "God knows what is best for individuals & for the world," he always submitted to God's will under even the most trying circumstances. Over the years, he viewed the constant illnesses that afflicted his family as God's "servants," sent to foster their spiritual improvement.15 He expressed grateful resignation upon the deaths of two infant sons: David Vinal, who lived only a few weeks after his birth in 1829, and Humphrey Washburn, who was born in 1832 and lived less than a year. He turned his obituary sermon for his closest friend, the Reverend Royal Washburn, into a lesson on "cheerfulness" and "happy resignation" in the face of adversity.16 He even thought of his wife's death as the "discipline of God. "17 By comparison, his ongoing troubles at Amherst were of little moment. He resigned himself to them completely, if anything becoming ever more single-minded in his dedication to his work and to evangelism. As a child, Helen heard some of her father's pointed sermons. She seems to have admired their strengths, for in adult life she always expressed pleasure in meeting people who had read the sermons reprinted in Humphrey's Memoir of her father, and she once urged the ministry on a young friend by assuring him that the glory of speaking in a pulpit could make up for any "necessities and embarrassments" associated with clerical life.24 In her youth, moreover, she was a daily witness to the diligence with which Fiske applied himself to his college duties, especially his writing. Over the course of his career, Nathan wrote a number of books and scholarly essays: like his sermons, they all, however varied in nature, were ultimately aimed at proselytizing his religion.25 His single-minded industry served as a powerful example for Helen, later inclining her not only toward diligence and perfectionism in her own career but also toward a desire to make her writing uplifting. Nathan's major literary undertaking was a textbook, an extensively annotated and expanded translation of a Manual of Classical Literature by the German literary historian Johann Joachim Eschenburg.26 He began work on the Manual in the fall of 1834, and in the course of preparing four successive editions labored on it until the summer of 1843. Throughout Helen's childhood, from the time she was four until she was almost thirteen, her father spent most of his time absorbed in this project. Because Nathan saw his Manual not only as a textbook but also as an important piece of moral didacticism capable of transforming the souls of its readers, he devoted himself to it with fervor. "It would not be far from the truth to say that he was always in his study when his health would allow," writes Heman Humphrey. "Call when you might, you would find him at his desk, with pen in hand, or poring over his text book and classics. "29 Nathan's relentless toil exhausted his energies and strained his relations with his family. In his journal, he records the severe toll taken on his health by his "diligent & labourious application" to each edition of the Manual: in 1839, for instance, the "immense" task "of preparing the copy & examining the proof" for the third edition "proved too much," and "symptoms of an incipient consumption" forced him to give up work of every kind for almost a year.30 Immediately upon his recovery, plans were made for the stereotyped fourth edition. Nathan was tormented by fears that the publishers of this new edition would steal his profits from the book, and he was so overburdened with preparing new copy that he had little time left over for parenting. In 1842, when Helen went through a period of great loneliness, having been sent away to Charlestown to spend three months with the family of her mother's beloved Aunt Vinal in order to ease Deborah's burdens, Nathan's work on the Manual kept him from granting her repeated requests that he come to visit her. What she received, instead, were long letters from her mother, apprising her how "very busy" her father was, struggling to supply his publisher with as many as "sixty or seventy pages a week. "31 At long last, her father did come, but his visit was only an addendum to a business trip to Boston, where he needed to examine some recently published books. Novelist, travel writer, and essayist Helen Hunt Jackson (1830–1885) was one of the most successful authors and most passionate intellects of her day. Ralph Waldo Emerson also regarded her as one of America’s greatest poets. Today Jackson is best remembered for Ramona, a romantic novel set in the rural Southern Californian Indian and Californio communities of her day. Ramona, continuously in print for over a century, has become a cultural icon, but Jackson’s prolific career left us with much more, notably her achievements as a prose writer and her work as an early activist on behalf of Native Americans. 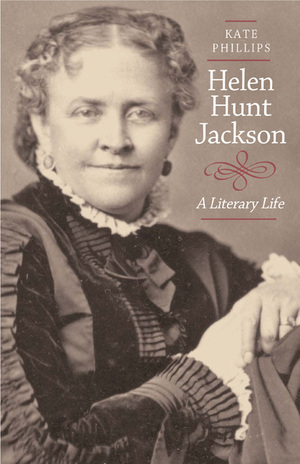 This long-overdue biography of Jackson’s remarkable life and times reintroduces a distinguished figure in American letters and restores Helen Hunt Jackson to her rightful place in history. Discussing much new material, Kate Phillips makes extensive use of Jackson's unpublished private correspondence. She takes us from Jackson's early years in rural New England to her later pioneer days in Colorado and to her adventerous travels in Europe and Southern California. The book also gives the first in-depth discussions of Jackson's writing in every genre, her beliefs about race and religion, and the significance of her chronic illnesses. Phillips also discusses Jackson's intimate relationships—with her two husbands, her mentor Thomas Wentworth Higginson, the famed actress Charlotte Cushman, and the poet Emily Dickinson. Phillips concludes with a re-evaluation of Ramona, discussing the novel as the earliest example of the California dystopian tradition in its portrayal of a state on the road to self-destruction, a tradition carried further by writers like Nathanael West and Joan Didion. In this gripping biography, Phillips offers fascinating glimpses of how social context both shaped and inspired Jackson's thinking, highlighting the inextricable presence of gender, race, and class in American literary history and culture and opening a new window onto the nineteenth century. Kate Phillips received a Ph.D. from Harvard University in the History of American Civilization and is an independent scholar and writer. She is the author of the acclaimed novel White Rabbit (1996, paperback 1997).